Acetaminophen is a less potent pain reliever that increases the effect of oxycodone. Percocet is used to relieve moderate to severe pain. Percocet addiction is typically fueled by the constant need to get more of the drug to prevent going into withdrawal. Percocet withdrawal occurs because the individual, whether they are legitimately prescribed the drug or they are taking the drug illicitly, develops a physical and mental dependence to the drug over time. When they stop using Percocet, they begin to experience the uncomfortable and painful response that the body goes through as a result. They will have strong cravings for Percocet, and withdrawal symptoms can be very similar to those experienced during heroin withdrawal. What are the withdrawal symptoms of Percocet? The withdrawal symptoms of Percocet include: flu-like symptoms, kicking movements, twitching, muscle spasms, hot and cold flashes and severe backache. Treatment for Percocet addiction is similar to treating other opioid addictions. Admission to a medically supervised detox clinic will help the user manage the negative withdrawal symptoms. In order to minimize these effects, it is recommended to gradually reduce the use of Percocet with the help of a health care professional. 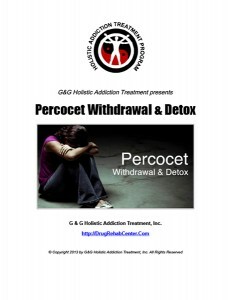 Indeed, once the acute effects of Percocet withdrawal are under control, the focus of Percocet addiction treatment shifts to helping the patient overcome future temptation and addressing pressing lifestyle, physical and emotional issues.